BDS International School has puts its flagship in the vicinity of Meerut City since last many years. School has got various recognition, awards, certificates and medals. The shining stars BDS International School participated in different national, regional and state level competitions organised by CBSE and other agencies. We feel proud to say that out students always brings laurels to the school. Many workshops and seminars are conducting for the growth of our faculty members and students. We are also conducting parents orientation programmed and workshop for the awareness of the parents towards current education system, general behaviour problem of the children, Parents role in children ;s education system. We are also contributing in the development of society by contributing our efforts in various social activities like Traffic Awareness Progamme, Swach Bharat Abhiyan and Say No To Polythene Bags. The School is playing a vital role in "My City, My Initiative" a campaign whose motive is to make Meerut City is one of the Vibrant City of the Nation. We have conducted many competitions and participated in different programmes to promote this noble and unique campaign. The School and Its students has got the appreciation from Hon. HRD Minister Smt. Smiriti Irani for contributing extraordinary efforts in process of Education. x School and its students has got a chance to meet The President of India-Shri Pranab Mukherjee on the day of Raksha Bandhan 29th august 2015. 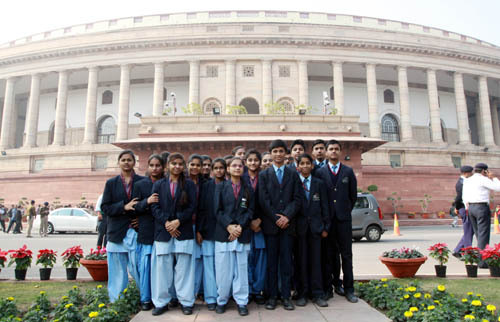 Students also got a chance to visit and attend the sessions of Rajya Sabha and Lok Sabha at Parliament House. School has also got appreciations for the active participation in the social events like Traffic Awareness Programme, Bharat Ko Jano, Road Safety, Kabir Peace Mission etc.